Conveniently situated half-a-block off The Downtown Mall, these executive offices are located inside The Maclin Building, an iconic downtown building. These executive offices feature an adjoining waiting room (fully furnished) for patients/clients, a private bathroom, a break room and a storage closet. Each executive office has its own private lock. Some of the executive offices have floor-to-ceiling windows. The monthly water bill, the electric bill and cleaning services for the waiting room are included in the monthly rent for all the executive offices. 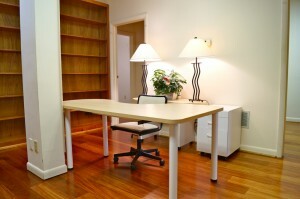 These executive offices are perfect for a therapist, a group of therapists, business professionals, counselors, etc. The builder of the offices used sound proof insulation inside the drywall for maximum privacy. The Maclin Building is a fully-secure building. The front door of The Maclin Building is secure with an after-hours lock. Entry into The Maclin Building is very private and discrete. A parking garage is located half-a-block away from The Maclin Building. Significant free on-street parking is available. Walk to more than 50 restaurants on The Downtown Mall. Enjoy a full-service grocery store (The Market Street Market) right next to The Maclin Building.